Many expected what was a virtual quarter-final between India and South Africa to be a game which would end with a nail-biting finish. However, contrary to expectations of a cracker of a game, the Sunday's fixture of the ongoing Champions Trophy turned to be a cakewalk for the Men in Blue as they registered an emphatic eight-wicket win over the Proteas at The Oval, London to enter the semi-finals of the ongoing 50-over marquee event. Chasing a lowly target of 192, the defending champions lost just two wickets and crossed the line in just 38 overs. India didn't had a great start to their chase as they lost Rohit Sharma (12) at team's score of 23. However, skipper Virat Kohli (76*), who came in next to bat, shared a 128-run partnership with opener Shikhar Dhawan (78). The left-handed opener, who had been in tremendous form in the Champions Trophy, was once again at his menacing best as he thrashed the South Africa bowlers to all the parts of the ground. In his 83-ball knock, Dhawan smashed 12 boundaries and a six while the swashbuckling Indian skipper accumulated 7 fours and a six in his 101-ball inning. Earlier, the Men in Blue came out with a brilliant performance, both with the ball and in the field, to bowl out South Africa for a paltry 191 in 44.3 overs. Put into bat, the Proteas had a solid start as both Quinton de Kock (53) and Hashim Amla (35) put on 76 runs for the opening stand. 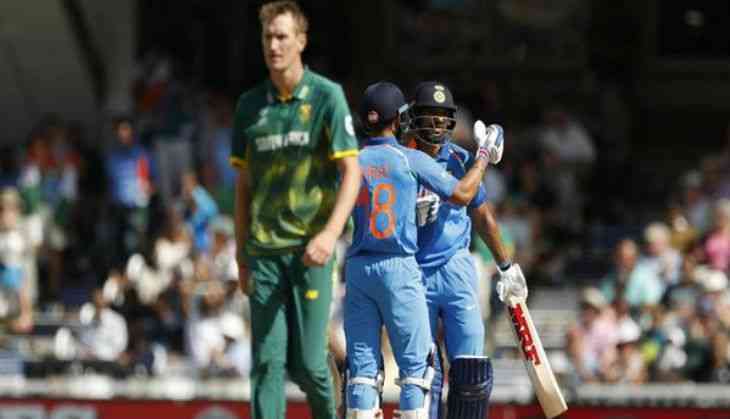 However, once Ravichandran Ashwin---playing his first match of the ongoing Champions Trophy---got the wicket of Amla, things just started to fall apart for the AB de Villiers-led side. After the duo, only Faf du Plessis could manage to stay on the crease for a bit long and contributed valuable 36 runs. The onus was on du Plessis to then bat through the innings. However, like the Pakistan match, he dragged one back off Hardik Pandya and got bowled. From 116/1, the Proteas found themselves struggling at 157/5. JP Duminy was the only recognised batsman in the middle and he too could not stay long and help his side reach to a respectable total. Apart from the brilliant bowling performance, the Men in Blue were exceptional in the field as they pulled off three run-outs to put the brakes during the course of the South African innings. Bhuvneshwar Kumar and Jasprit Bumrah both picked up two wickets while Pandya, Ashwin and Jadeja all chipped in with a wicket each. Bumrah was adjudged the Man of the Match for his stupendous bowling performance. India will now face Bangladesh in the second semi-final on June 15 while Group A topper England will face the winner of the final Group B fixture between Sri Lanka and Pakistan to be played at Sophia Gardens, Cardiff on Monday.